Bye-bye John McLaughlin, you magnificent beast. The Yale University Art Gallery and Center for British Art face each other across Chapel Street in New Haven, Conn. They are the closest thing on campus to church, including churches, though I rarely think of anything so lofty when I walk by. It’s where Bill Clinton crossed a picket line to pick up a girl. My own church was News Haven, the newsstand where I spent hours poring over journals. Dr. John McLaughlin was my patron. I am at the youngest end of the viewership for “The McLaughlin Group,” which debuted around the time I was born. Outside of family stories, “The McLaughlin Group” was my most significant encounter with pre-Vatican II Catholic culture. It was ritual for as long as I can remember. The NBC affiliate in Washington, D.C., broadcast the show twice, once on Saturday after the vigil Mass and once on Sunday after the high Mass. My mother’s side of the family was, like McLaughlin, from Providence and other places. My father, like McLaughlin, was educated by the Christian Brothers, and he would just laugh and laugh through the whole show. My parents dressed like the panelists, preppy and crisp; they told me Jesuit schools weren’t a financial option for their families and that McLaughlin was what a Catholic education was. They knew that I was a generation removed from Catholic guilt: No one made me diagram a sentence or memorize the Baltimore Catechism. If my skin was red and my hand muscles wailed, I probably hurt them in sports practice. No autocrat ruled my public school classrooms. We sang folk songs. Each week, I hastily filled in C.C.D. worksheets, then went home to “McLaughlin,” my real religious education. As a kindergartener, I strained to imagine anything more fun than “The McLaughlin Group.” It was campy, with personalities who ate scenery like classically trained actors. It allowed girls like Eleanor Clift to play with the boys, which made me think I could. The panelists lived nearby and looked and talked like people I knew, even if they didn’t think like me. Niceness was a bipartisan consensus. Argument was higher ground. I liked it better than most sitcoms. Sometimes I would ask my parents to reschedule Mass times to accommodate viewings. The Clintons fascinated “The McLaughlin Group,” so they fascinated me the way other kids my age might have obsessed over dinosaurs or outer space. The names of their advisers rolled off my tongue as naturally as the 50 states and first ladies. I eagerly read Primary Colors when it was first released, then read the Reliable Source column in The Washington Post and watched “McLaughlin” to hear the gossip surrounding the identity of the author. I’m not sure I’d ever heard a Fleetwood Mac or Joni Mitchell song before the 1992 election, but “The McLaughlin Group” told me what they meant as Clinton signifiers. That is not how it worked. I did not live in a Gothic tower or a brick meetinghouse, but an ahistorical “swing space” next to a power station. On one side was the gym where a researcher used to measure the entering freshmen’s spines to figure out what physiques are the strongest. A famous photo of the Clintons appears to have been taken in this area, with Bill holding books loose in his right hand (per Hillary) “like a Viking.” I could very easily imagine this Bill at the seaside reading One Hundred Years of Solitude. Next to the power station was the turn to the law school, near Grove Street Cemetery, whose entrance reads “THE DEAD SHALL BE RAISED.” Even the graveyard was triangulating! At Yale, everybody was a Clinton. I was horribly homesick. To distract myself, I would visit any place on campus that reminded me of Washington, including weekly Mass, and watch “The McLaughlin Group.” The campus had a great Catholic intellectual life, but I was too suspicious of its earnestness to throw myself in. It wasn’t like TV. As a litmus test for visitors, I tacked David Brooks articles on the walls of my dorm room. It was a joke, like all the shows I liked. What if a guy who was into politics had looked over, and kept looking over? Would I introduce myself, liking that he laughed? I had all the faith in the world that I could succeed on my terms, but I never got the guy, although I got Chris Matthews—a.k.a. John McLaughlin II. At some point Matthews told me to get as far away as I can, for as long as I can, from D.C., maybe go to Swaziland, as he did as a Peace Corps volunteer—not because I wasn’t good, but because he wanted me and everybody else to stay good. I never forgot. As graduation approached, something in me snapped. By the time I got back to school, Hurricane Katrina footage was on TV 24/7. I had just been in London after the public transit bombings. Such events made shows like “The McLaughlin Group” seem inconsequential. I experienced a spiritual crisis, then floundered into inner-city teaching and, eventually, medicine. The political fantasy lost its potency. Entry-level careers in the “helping professions” are very hard on people, in ways it is only now fashionable to come out about. I am brought low every day. My career is a mixed bag: a decade of low pay for punishing hours, extended stints in public health infrastructure that should embarrass every American—with the added awareness that the people for whom I work have it far worse. The work radicalizes the witness, yet I didn’t think about vocation at all, and still don’t, except in the context of the show. A "pivot" from political media to the helping professions is a cultural misfit, akin to that of entering religious life from the corporate world. 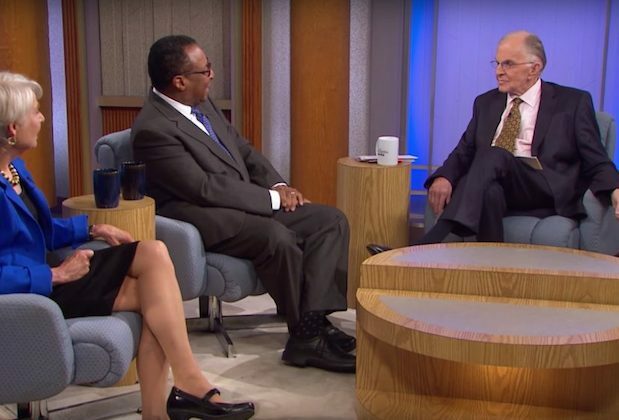 In some weird way, “The McLaughlin Group” highlights that shift for viewers. The severity and rigor is simply foreign. I thought of it when I watched Rudy Giuliani’s Republican National Convention speech, the priestly theatricality. (There was a recurring theme of Catholic suffering at the R.N.C., a passion play including a cover of David Bowie’s “Station to Station.”) McLaughlin would have recognized Giuliani as a phony from a mile away yet delighted in his flamboyant act as the monsignor out for the second collection. Had the Hillary Clinton campaign needed information on how to interview Donald Trump, they needn’t have looked any further than John McLaughlin. Whatever one’s feelings about McLaughlin’s politics or rectitude, it is hard to deny his righteous star power. People are into the McLaughlin persona, but also into what he conveys as a celebrity Jesuit: truth-seeking, confronting doubt, sustained engagement with the world. He insisted on decorum and never fell for pious appeals to “civility.” He was energized by a secular mission rather than moved to despair. Was John McLaughlin a “happy warrior”? He hadn’t had the fire for quite some time. There was something beatific about him in his prime. It wasn’t radiant calm, it was heat, right out of his eyebrow. Ite inflammate omnia. When I get bored reading prostate biopsies at work and want to talk about politics, I will have to remind myself all of them are his group. John McLaughlin has always complicated my thinking like that. In my professional role as a pathologist, I am often distracted by the news cycle’s oncologic imagery: cancers, viral memes, foreign bodies, transplant rejection, autopsy reports. Prediction: John McLaughlin will outlive prostate cancer and create a new hormonal therapy. This article also appeared in print, under the headline "Group Therapy," in the October 3, 2016 issue. Maureen Miller, M.D., is a pathologist in New York.